This week has been unreal. At every turn, it gets better. I keep asking God what I did to deserve all of this. I am so thankful for and humbled by this opportunity. 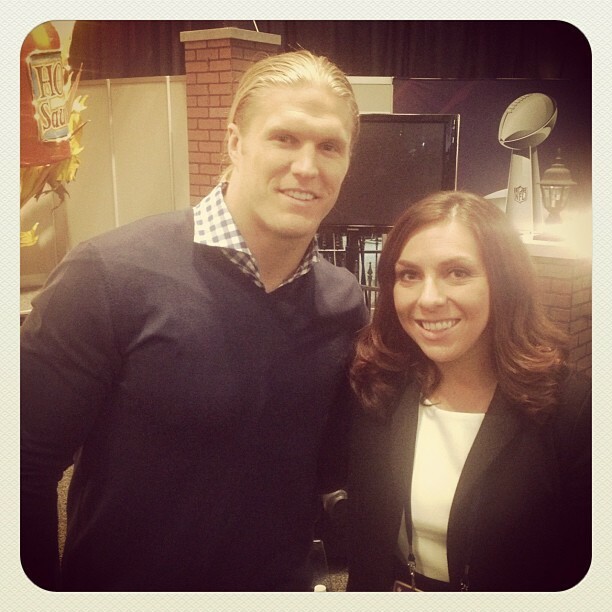 Yesterday morning began with an interview with Clay Matthews. We got off to a rough start when I said, “I know your longsnapper!” (Meaning, I know the Packers’ longsnapper). Clay heard, “I know you’re a longsnapper!” He looked at me like an idiot and said, “I am not a longsnapper.” After I explained that I knew Brett, we both got a good laugh and on with the interview. I was really impressed by Clay. He spoke a lot about wanting to be a role model off the field and to be known for things other than being a fierce competitor. There’s a lot other NFL players can learn from him. 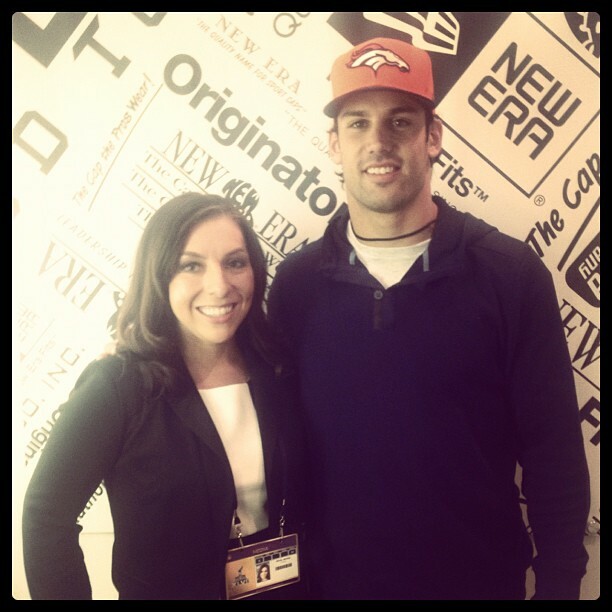 After I talked with Clay, I headed over to interview Eric Decker about his New Era endorsement. My girl friends were all obviously jealous about this, but honestly, I was just happy to be able to talk to a Broncos player. Eric says the Broncos will play in the Super Bowl next year, as all of the foundational pieces are there. I sure hope so! I had a really neat lunch experience. The team dietician for the Houston Texans was on hand yesterday working with Gatorade. She made a lunch for me so I could “eat like a Houston Texan.” The meal was delicious and consisted of a mixed greens and berry salad, multi-colored potatoes, a perfectly seasoned salmon fillet, a vegetable medley and roll. What a treat! Later, Gatorade held a press conference. They seated me in the first row and told me to prepare to order a Gatorade and know what flavor I want. Later, J.J. Watt appeared and took my Gatorade order. He is a great ambassador for the brand. I taped a couple of radio shows during the day, including my friend Rachel Baribeau’s show on CBS Radio Atlanta. 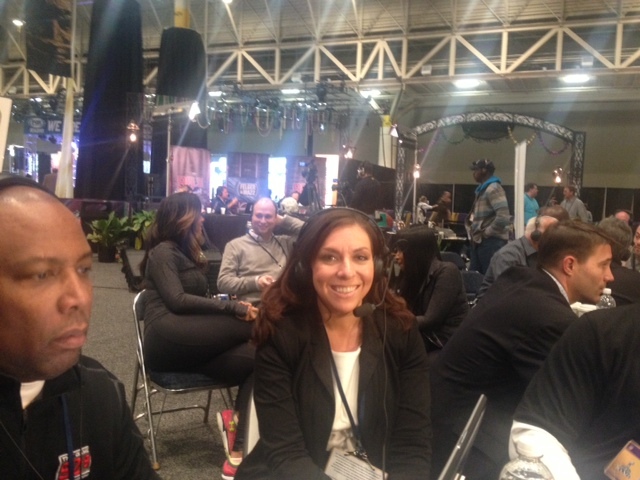 Her co-host is former NFL and University of Colorado quarterback, Kordell Stewart. Once Kordell realized I’m from Colorado he started asking a lot of questions about what I do out there and the city. It was great to connect with him about our Colorado experiences. After the radio shows were over, I walked back to where I’m staying to freshen up for a night out. I was lucky enough to join some friends at the Commander’s Palace for dinner. While I’ve experienced some great things here, this was by far my favorite experience of the week. We were literally treated like the queens of Commander’s Palace. When our reservation time came about, we were escorted to our table. All of the table cloths were white and ours had a long, green satin ribbon stretched across it. I noticed the ribbon and just thought it was an interesting decor choice. However, I was later told by a friend who frequents the restaurant that this signals to the waitstaff that the table’s guests are VIP. We chose to enjoy a six-course tasting menu which included things like crawfish gnocchi, caviar and the most delicious beef tenderloin I’ve ever eaten. This was the best meal I have eaten in my entire life. 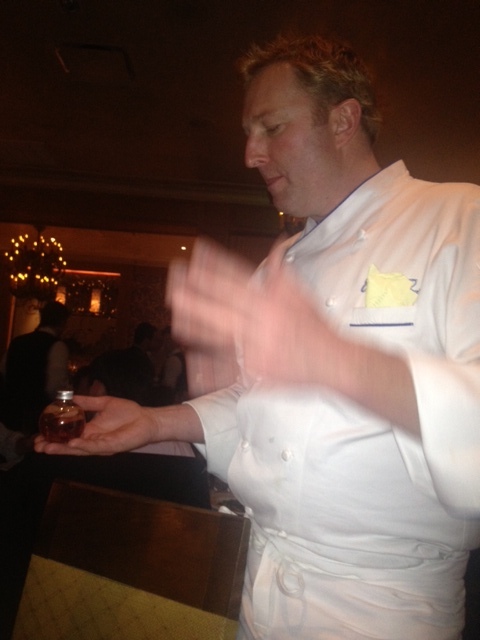 At the end of the meal, the head chef came to our table and said he had a couple of surprises for us. The first was a special moonshine he made especially for us. We all tasted the moonshine with the chef, and needless to say, it was delicious but potent. Seated next to us was Houston Texans player Connor Barwin who inquired about the moonshine. Since it was made especially for us, he was unable to have any so I shared my glass with him. The group of people he was with were kind and fun, as was he. After the moonshine, I noticed that a bunch of chefs and waitstaff were walking through the restaurant with an absurd amount of dessert. Little did I know that they were bringing it all to our table of three people. 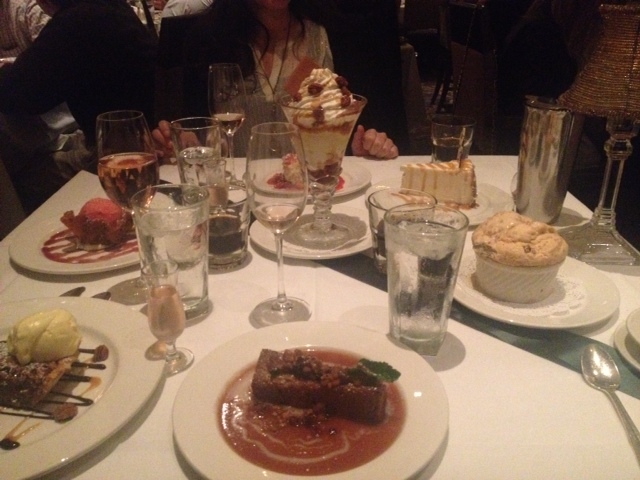 Yes, every single dessert that Commander’s Palace serves was brought to our table. Talk about feeling like royalty! These things were done for our table and none others that I saw, including Sofia Vergara’s. I really don’t know what I’ve done to deserve this, but it is a night I will never forget. Dinner took upwards of four hours. It was worth every minute. After dinner, we headed over to Bud Light Hotel, where Flo Rida and Pitbull were playing. I called it an early night as I am growing more exhausted each day and trying to save as much energy as possible for Sunday! Alicia I am soooo jealous!!!!! What a Great experience! !